For many people making crafts is a hobby. It can be a form of relaxation, or a way to provide handmade gifts to family and friends. But some people make supplementary income by selling crafts, or even do it as a full-time job. To make money selling crafts, doing the actual crafting is only part of the process. You need to strategize, prioritize, and advertise, among other things. Perhaps you make several types of crafts, but aren't sure which one would be a strong seller. Or maybe you want to go "all-in" on crafting for profits despite a lack of previous experience. You may want to start by seeing what others are selling successfully. Visit craft shows in your area, local retailers that sell crafts, and websites that specialize in selling handmade items. What are other crafters trying to sell, how much are they selling it for, and do they seem to actually be making sales? Depending on your situation, you may be seeking validation of the possible profitability of your chosen craft, or inspiration on the type of crafting to focus your energies on. Being inspired by others is a good start, but you also need to be motivated to do the work. If you're going to make some real money by selling your wares, you'll have to dedicate substantial time and energy to making, marketing, selling, and shipping your craftwork. If your heart is not in it, your chances of success are minimal. If you find that hand-weaved baskets seem to sell well, but you hate basket weaving and much prefer working with ceramics, you're probably best served to follow your passion. At very least, you'll "go down swinging," as they say. Some of the work involved in selling crafts can be repetitive drudgery, so it is helpful if the creation component of it is at least stimulating and enjoyable. Let's face it - if people want junk crafts, they will just buy mass-produced knock-offs at a big box retailer for a lower price. Many people love handmade items, but they want those hands to be skilled ones. 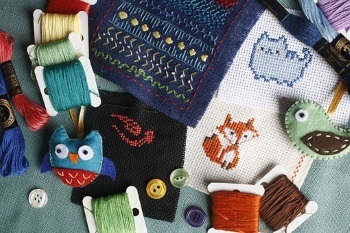 You need to do a reality check — is your crafting good enough to stack up to the competition? Your birdhouses or vases may be good enough to give your niece for her birthday, but are they good enough for strangers to pay real money for them? You may want to take some time mastering your craft before jumping into sales. It is better to build a reputation for high quality craftsmanship right from the start. Whether you are selling crafts, cars, or commercial real estate, you need to have some talent for running numbers and estimating costs and profits to be successful. You have to be practical about the potential profitability of your craftwork. When establishing the "price point" for your craftwork, you need to consider the cost of materials; supplies, equipment, and possibly workspace; advertising; stocking your items for sale; shipping (especially if selling online); labor (yours and possibly others'); and the retail markup, which should probably be at least in the 30-35% range. If you cannot produce your craft for a reasonable price while still making a profit, then you need to change your craft, streamline your methods, or forget about making money this way.